Sign in to Amazon with the account associated with your Alexa-compatible device (for example, Amazon Echo). Open a new tab and go to https://davis.dynatrace.com. Sign in and open the User profile menu in the top-right corner of the window. Click Account settings and navigate to Integrations > Alexa. Click the Notifications toggle and then click Save permissions. Select the Dynatrace environment you&apos;d like to be associated with your Amazon account and click Select environment. This can be changed later in Account settings > Integrations > Alexa. 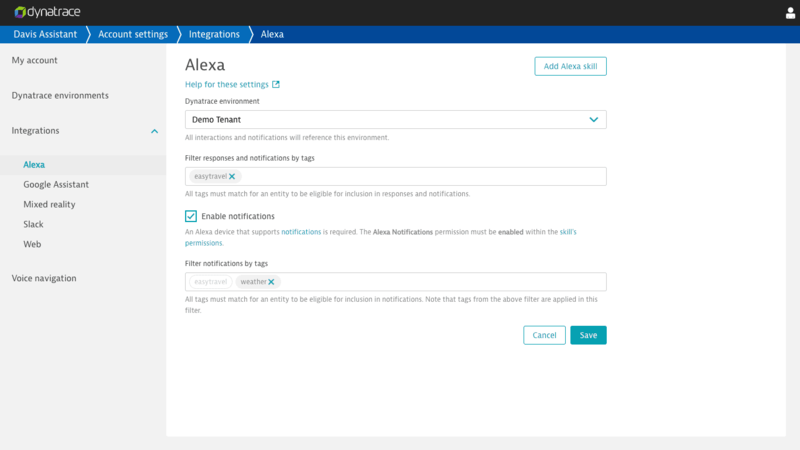 Optionally, navigate to Account settings > Integrations > Alexa and add tags to the filter inputs. With your Alexa-compatible device nearby, say Alexa, launch Davis. You should now be able to interact with Dynatrace. Optionally, you can add the Davis Assistant Voice Navigator Chrome extension to Chrome. 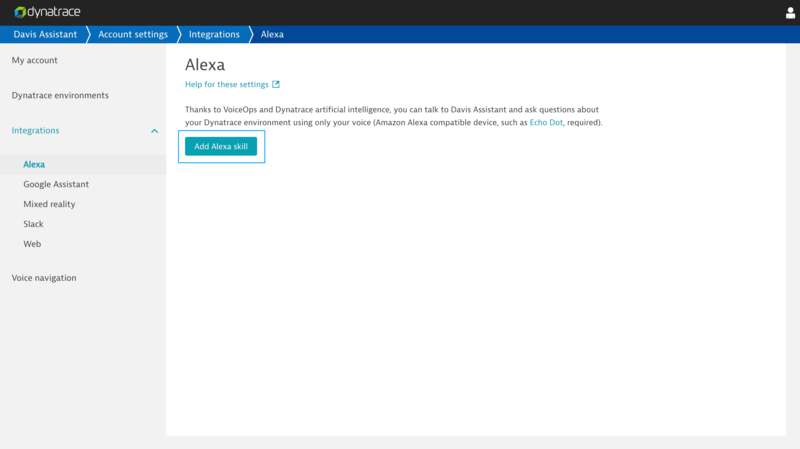 The extension allows you to view Dynatrace pages associated with interactions using the Davis Assistant Alexa skill. Due to restrictions imposed by Amazon, international users must select English as their language within the Alexa app. 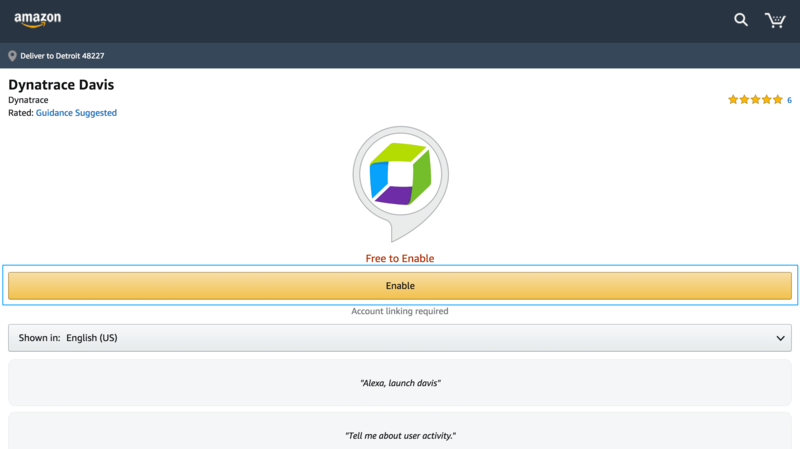 After adding the Davis Assistant Alexa skill to the Amazon account associated with your Alexa-compatible device, you can start a conversation with Davis Assistant by telling Alexa Alexa, launch Davis. Also, as a shortcut, you can immediately say a phrase or ask a question such as Alexa, ask Davis what happened yesterday. Davis Assistant continues to listen for a few seconds after a response that includes an optional follow-up interaction. If Davis Assistant stops listening, you&apos;ll need to preface your next interaction with Alexa, ask Davis. If you have a computer running the latest version of Chrome, you can optionally add the Davis Assistant Voice Navigator Chrome extension to Chrome. 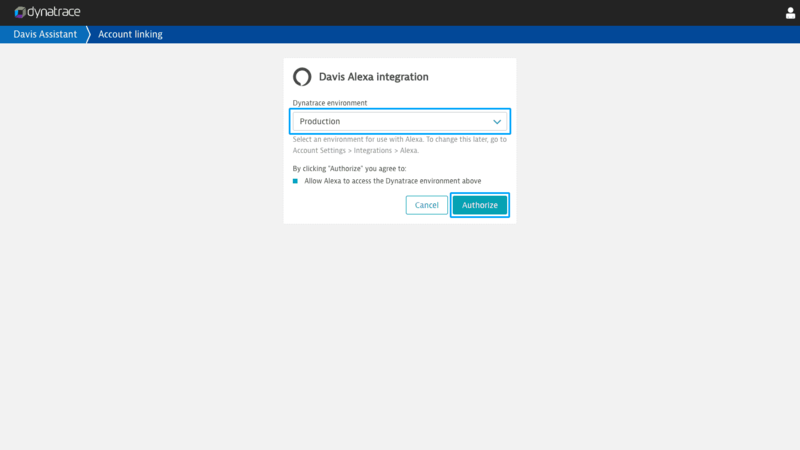 The extension enables automatic navigation to any Dynatrace pages that are referenced in your Davis Assistant Alexa skill interactions. Within the Davis Assistant web application, navigate to Account settings > Integrations > Account settings. Under Dynatrace Environment, select an alternative environment. The Dynatrace Environment selector only appears if you have more than one environment associated with your account.